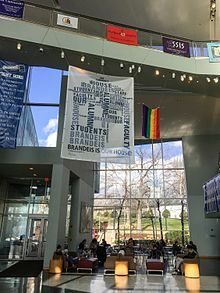 Brandeis University /ˈbrændaɪs/ is an American private research university in Waltham, Massachusetts, 9 miles (14 km) west of Boston. 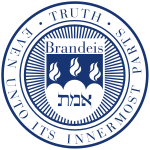 Founded in 1948 as a non-sectarian, coeducational institution sponsored by the Jewish community, Brandeis was established on the site of the former Middlesex University. The university is named after Louis Brandeis, the first Jewish Justice of the U.S Supreme Court. 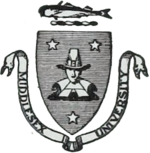 Middlesex University was a medical school located in Waltham, Massachusetts, that was at the time the only medical school in the United States that did not impose a quota on Jews. The founder, Dr. John Hall Smith, died in 1944. Smith's will stipulated that the school should go to any group willing to use it to establish a non-sectarian university. Within two years, Middlesex University was on the brink of financial collapse. The school had not been able to secure accreditation by the American Medical Association, which Smith partially attributed to institutional antisemitism in the American Medical Association,  and, as a result, Massachusetts had all but shut it down. 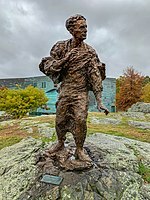 The trustees offered to name the university after Einstein in the summer of 1946, but Einstein declined, and on July 16, 1946, the board decided the university would be named after Louis Brandeis. Einstein objected to what he thought was excessively expansive promotion, and to Goldstein's sounding out Abram L. Sachar as a possible president without consulting Einstein. Einstein took great offense at Goldstein's having invited Cardinal Francis Spellman to participate in a fundraising event. Einstein also became alarmed by press announcements that exaggerated the school's success at fundraising. On the fourth day of the protest, the Middlesex Superior Court issued a temporary restraining order, requiring the students to leave Ford Hall. While Abram said he would not allow the order to be enforced by forcibly removing the students from Ford Hall, he did say that 65 students had been suspended for their actions. On January 18, the black students exited Ford Hall, ending the eleven-day occupation of the building. Brandeis and students still were not in agreement on one of the demands, namely the establishment of an autonomous department on African American studies. Brandeis insisted that such a department be subject to the same rules as any other department. There had been no violence or destruction of property during the occupation, and Brandeis gave the students amnesty from their actions. Ronald Walters became the first chair of Afro-American studies at Brandeis later the same year. Ford Hall was demolished in August 2000 to make way for the Shapiro Campus Center, which was opened and dedicated October 3, 2002. In 2014, Brandeis announced it would offer an honorary doctorate to Ayaan Hirsi Ali, "a staunch supporter of women's rights",  and an outspoken campaigner against female genital mutilation, honor killing and Islamic extremism in general. After complaints from the Council on American-Islamic Relations and internal consultation with faculty and students, Brandeis publicly withdrew the offer, citing that Ali's statements condemning Islam  were "inconsistent with the University's core values". 87 out of 511 faculty members at Brandeis signed a letter to the university president. While some commentators such as Abdullah Antepli, the Muslim chaplain and adjunct faculty of Islamic Studies at Duke University, applauded the decision and warned against "making renegades into heroes",  other academic commentators such as the University of Chicago's Jerry Coyne  and the George Mason University Foundation Professor David Bernstein  criticized the decision as an attack on academic values such as freedom of inquiry and intellectual independence from religious pressure groups. With more than 4,000 enrollments a year,  the Rabb School of Continuing Studies develops educational offerings across four distinct divisions. It provides professional development opportunities through degree programs, personal enrichment and lifelong learning. One of four graduate schools on campus, the Graduate School of Arts and Sciences (GSAS) offers over 40 programs, 18 of which are doctoral programs. Brandeis graduate students are eligible to cross-register for courses at Boston College, Boston University, Tufts University, and the Graduate Consortium in Women's Studies at MIT. Brandeis is also a member of the Boston Library Consortium,  composed of 18 academic and research institutions in Massachusetts, Connecticut, Rhode Island, and New Hampshire. The Brandeis Library  provides resources and services to support research, scholarship, teaching, and learning on campus. The Heller School for Social Policy and Management, founded in 1959, is noteworthy for its graduate programs in healthcare administration, social policy, social work, and international development. Internships, research assistantships and other hands-on experiences are available throughout the curriculum. The global and experiential dimensions of education at Brandeis are carried out through international centers and institutes, which sponsor lectures and colloquia and add to the ranks of distinguished scholars on campus. 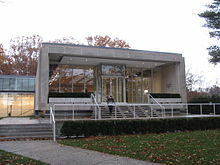 In 1980, Brandeis University established the Maurice and Marilyn Cohen Center for Modern Jewish Studies,  the first academic center devoted to the study of Jewish life in the United States. The Cohen Center's work spans basic research on Jewish identity to applied educational evaluation studies. The center's recent signature studies include research with participants in Taglit-Birthright Israel, investigations of synagogue transformation, and analyses of Jewish summer camping. CMJS research has altered the understanding of contemporary Jewish life and the role of Jewish institutions in the United States. The Schuster Institute for Investigative Journalism was launched in September 2004 as the first investigative reporting center based at a United States university. It was named for founding benefactors Elaine Schuster and Gerald Schuster. Among the better-known graduates are co-creators of the television show Friends David Crane and Marta Kauffman, political activists Abbie Hoffman and Angela Davis, journalists Thomas Friedman and Paul Solman, Congressman Stephen J. Solarz, physicist and Fields medalist Edward Witten, novelist Ha Jin, political theorist Michael Walzer, actress Debra Messing, philosopher Michael Sandel, Olympic Silver Medalist fencer Tim Morehouse, social and psychoanalytic theorist Nancy Chodorow, author Mitch Albom, filmmakers Debra Granik and Jonathan Newman, music producer Jon Landau,  and computer scientist Leslie Lamport. 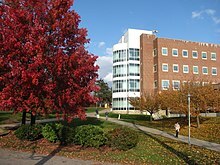 The university's Division of Science encompasses seven departments (Biochemistry, Biology, Chemistry, Computer Science, Mathematics, Physics, and Psychology), five interdepartmental programs (Biochemistry & Biophysics, Biological Physics, Biotechnology, Genetic Counseling, Molecular & Cell Biology, and Neuroscience), six science centers (Ashton Graybiel Spatial Orientation Laboratory, National Center for Behavioral Genomics, Rosenstiel Basic Medical Sciences Research Center, Sloan-Swartz Center for Theoretical Neurobiology, Benjamin and Mae Volen National Center for Complex Systems, and W.M. Keck Institute for Cellular Visualization), and more than 50 laboratories  that investigate fundamental life processes ranging from the structure and function of individual macromolecules to the mechanisms that control the behavior of whole organisms. 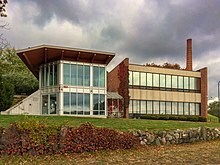 In 2014, the National Science Foundation renewed funding for Brandeis' Materials Research Science and Engineering Center (MRSEC), which was established in 2008. This center supports interdisciplinary and multidisciplinary materials research and education that address fundamental problems in science and engineering that are important to society. In particular, the center uses simplified components to create new materials that have some of the functionalities found in living organisms. Wien International Scholarship  was instituted by Brandeis University for international undergraduate students. It was established in 1958 by Lawrence A. and Mae Wien. The family had three objectives: to further international understanding, to provide foreign students an opportunity to study in the United States, and to enrich the intellectual and cultural life at Brandeis. The Wien Scholarship offers full or partial tuition awards; these awards are need-based and require the applicants to present outstanding academic and personal achievement. Each year, the recipients of the scholarship take a week-long tour of a destination in the United States. In previous years, the students have visited the United Nations in New York City, and did relief work in New Orleans following Hurricane Katrina. In April 2008, the university hosted a three-day-long celebration for the 50th anniversary of the program. ^ a b c " Brandeis University: Student Life". U.S. News and World Reports. Retrieved December 20, 2018. ^ Antepli, Abdullah (April 10, 2014). "Hats off to Brandeis University!". The Chronicle. Duke Student Publishing Company. Archived from = the original Check |url= value ( help) on 2014-06-26. Retrieved April 16, 2014.